(MP127). C E Turner (1883-1965). Watercolour signed, undated..
Standard size: 10 1/2 x 16 ins (26.7 x 40.5 cms) approx. Available at variable sizes to order. Price band: £130-155. A chart showing the layout of all the ships is included with this print. At 3.00pm on Monday 15th June 1953 the Despatch Vessel HMS SURPRISE (Cdr R A M Hennessey DSC RN) wearing the Royal Standard and preceded by custom by THV PATRICIA, slipped from South Railway Jetty, HM Dockyard Portsmouth for the Solent; and at 3.30 pm to a thunderous gun salute from the ships at Spithead, she entered the review lines. There to greet the new Queen were 197 ships of the Royal Navy, 13 ships of Commonwealth navies, 16 ships of foreign navies, 51 merchant ships and auxiliaries and 4 RNLI lifeboats. The 9 lines of ships ranged from No Man’s Land Fort in the east to the River Medina in the west. Although a Flag Officer Royal Yachts (V Adm E M C Abel-Smith CB CVO) had been appointed and was in attendance aboard SURPRISE, the new Royal Yacht was not yet completed  indeed she had been named BRITANNIA only 2 months earlier at her launch by the Queen. But as Charles Turner clearly shows in this fine painting, SURPRISE provided a very adequate substitute for a royal yacht and took up her temporary duty with style. Here we see her with the Queen and Prince Philip in the specially constructed podium on B gun deck, on the first leg of the Queen’s review, passing down between Lines F and G. Astern of SURPRISE are HMS REDPOLE (Cdr M J L Blake RN) acting as Admiralty Yacht, HMS STARLING (Lt Cdr N M Mules DSC RN), HMS FLEETWOOD (Lt Cdr D M Vaughan-Hughes RN), HMS HELMSDALE (Lt Cdr D D Macfarlan RN), the ocean liners SS PRETORIA CASTLE, SS ORCADES and SS STRATHNAVER; and local Portsmouth to Isle of Wight ferries, MV BRADING and MV SOUTHSEA. 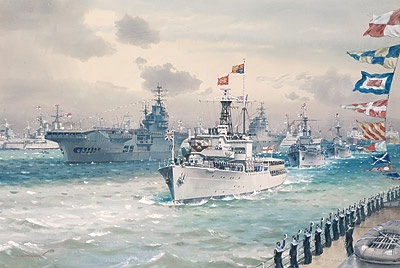 In the foreground of the painting and cheering ship is the Spanish cruiser MIGUEL DE CERVANTES, named after the famous 16th century Spanish novelist, playwright and poet; and on SURPRISE’s starboard side (from right to left) the battleship HMS VANGUARD (Capt R A Ewing DSC RN) wearing the flag of the C-in-C Home Fleet, Admiral Sir George Creasy KCB CBE DSO MVO, HMS EAGLE (Capt A N C Bingley OBE RN) flagship of V Adm J Hughes-Hallett CB DSO (Flag Officer Heavy Squadron, Home Fleet); and HMS INDOMITABLE (Capt W J W Woods DSO* RN). Visible over INDOMITABLE’s round down aft lies HMCS QUEBEC (Capt P D Budge DSC CD RCN) wearing the flag of R Adm R E S Bidwell CBE CD (Flag Officer Canadian Coronation Squadron). Over QUEBEC’s stern can be glimpsed HMS AGINCOURT (Capt J Lee-Barber DSO* RN), Captain D 4th Destroyer Squadron. Over INDOMITABLE’s bows are the funnels of HMS GLASGOW (Capt B Bryant DSO** DSC RN) wearing the flag of the C-in-C Mediterranean Fleet, Admiral The Earl Mountbatten of Burma KG DSO; whilst over the carrier’s flight deck is another Southampton Class cruiser, HMS SHEFFIELD (Capt J G T Inglis OBE RN) recently returned from the Americas and West Indies Station.